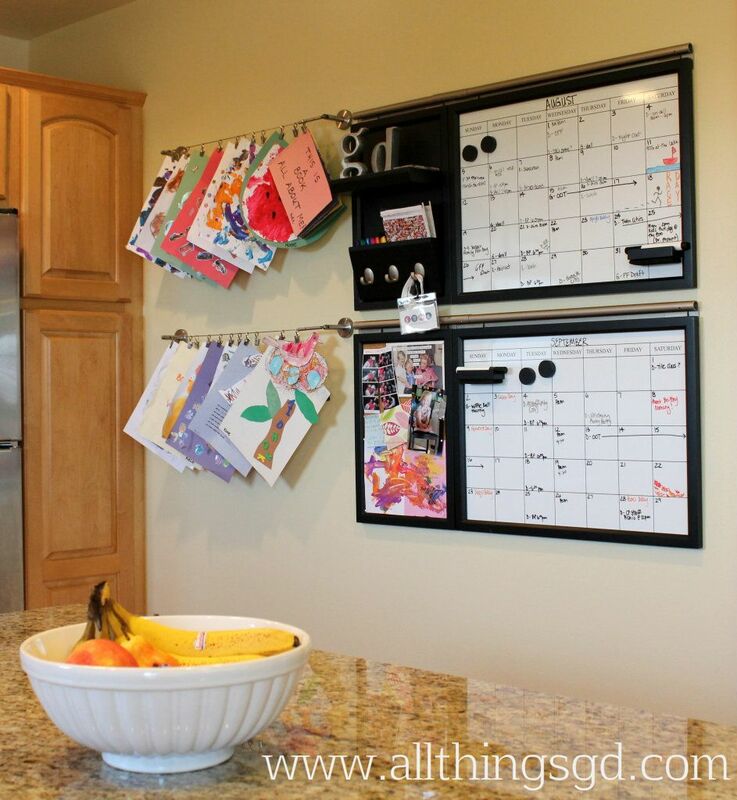 A year ago I shared our kitchen calendar command center – a system that continues to keep our schedules organized and our lives running smoothly – and now I’ve added to it! 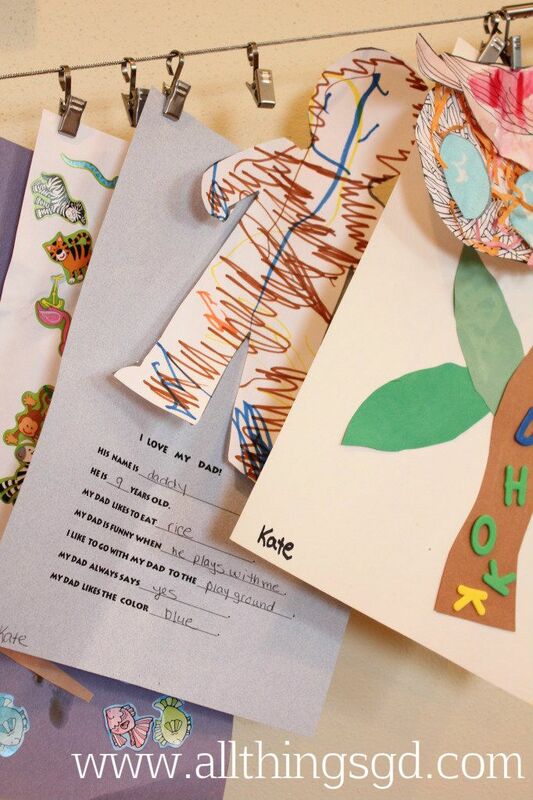 Between finger painting and sticker collages at home, and countless art projects completed at daycare, taping Kate’s masterpieces to the front of the refrigerator just wasn’t cutting it anymore. 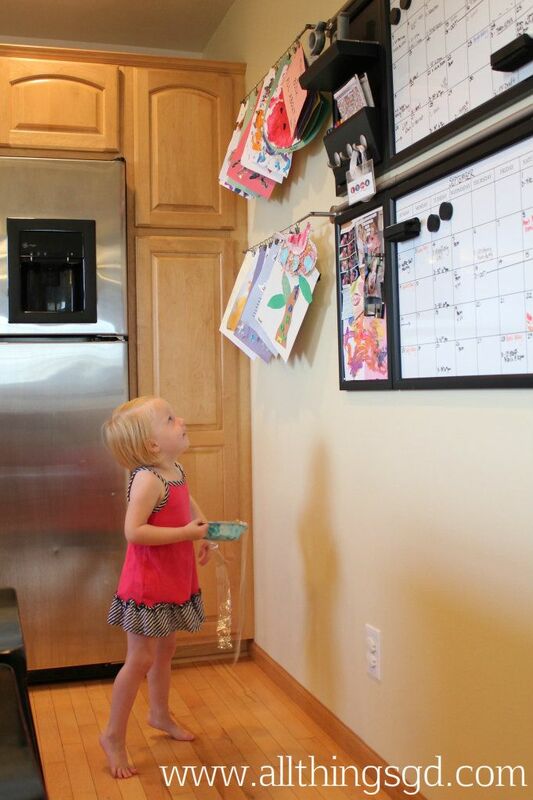 I needed a practical and stylish solution for keeping all her fun artwork on display in an organized fashion, and a recent trip to IKEA provided just what I needed. Using two sets of IKEA’s Dignitet curtain wires and one package of Riktig curtain clips, we now have the perfect spot to keep dozens of Kate’s art projects on display! Children’s art display using curtain wires and clips. Kate loves seeing all her fun art work showcased on the wall! She’ll often ask us to clip new projects up when she brings it home, or take something down so she can play with it (like the homemade jellyfish art project she’s holding in her hand). One of our favorite art projects Kate has brought home from daycare so far is this “I Love My Dad!” drawing and worksheet, given to G for Father’s Day earlier this year. Her daycare teacher did a little interview with her, asking her questions about her Daddy, and filled in the blanks with Kate’s response. Can you see her response to the sixth question? (Click on the picture to enlarge.) G and I are still laughing about that one! At only 2 1/2 years old she already has her daddy pegged! Kate’s Father’s Day gift to G this year. I hate clutter, so the thing I especially love about Kate’s new art display is that it showcases nearly 30 of her proud projects for us to enjoy and guests to see . . . without taking over our entire kitchen. See for yourself! Nearly 30 pieces of children’s artwork on display – without taking over the kitchen! Our little artist, dancing with her jellyfish! 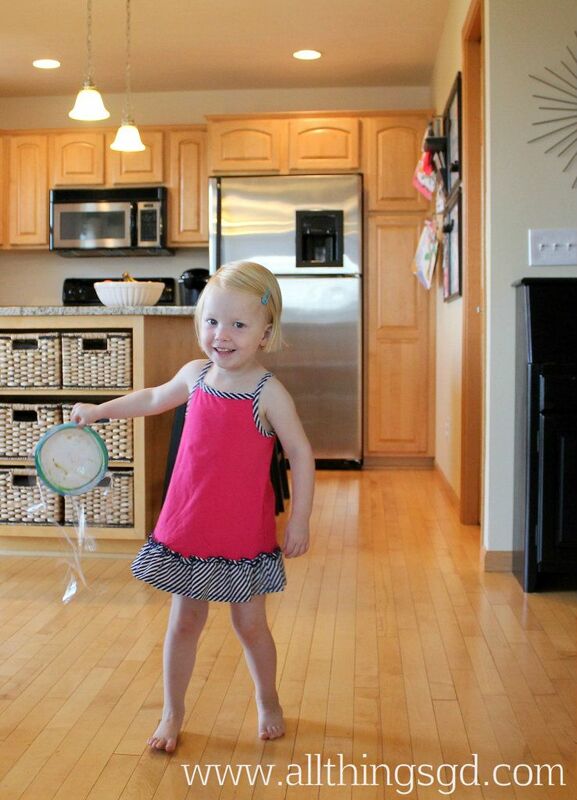 Kate (31 months) dancing in the kitchen with one of her art projects. 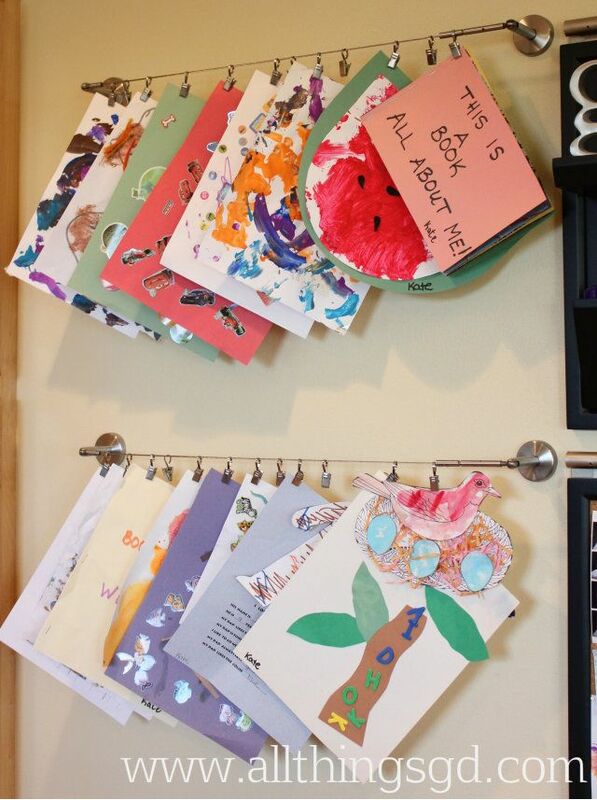 How do you keep your child’s artwork on display (and under control)? I’d love to hear your ideas! Anna got a set of “first crayons” for her 1st birthday at the end of July, and while she masters the ‘art’ of drawing/coloring, we’re using the front of the fridge to display her masterpieces. But I love the idea you’ve come up with — very cute! And with IKEA pricing, probably not too expensive, either. P.S. — Still loving the new countertops! Cute idea! What is the name of the granite you used for your countertops? We’re getting ready to pick out granite for our kitchen and I really like the look of yours. Love that idea! I’m still looking for a long-term solution for saving the “keepers” of my kids artwork. Would love to see what you do with Kate’s art after it’s on display! Great idea D! It looks beautiful and holds so much…we definitely need something like this for the boys. I love this! To display my kids art I did something you have probably seen all over Pinterest – took old frames, removed the glass and covered the mat in a linen looking fabric. I then hot glued alligator clips to the top of 2 of the frames – they were made to hold an 8 x 10 picture. I had one really big frame – and I put ribbon going across the top and bottom and use clothespins to clip on art. I love the frames with the alligator clips because it can really highlight a piece of work. But, the other frame often looks messy. I may have to think about replacing the messy frame with your idea. I think it would look a lot better! Thank you for the inspiration! I have the same concept for Sophia and Piper’s art in the hallway. I hung a wire that runs along the chair rail and then use clothes pins to hold the art…it is like a mini gallery. When that gets overrun, and it does with two kids turning out art faster than I know what to do with, I simply scan it in and create their own digital art gallery. Such a cute idea D! I always feel like a bad Mom not having any of Jillian’s artwork on the fridge bu I am like you…I hate clutter! This turned out so cute! fantastic idea, i think I’m going to do the same! What a cute display idea! 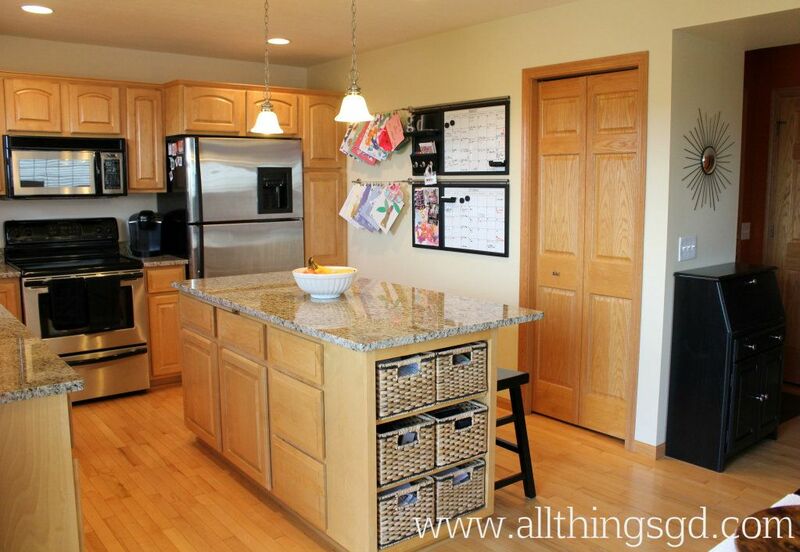 Your kitchen still looks so neat & organized even with all the art– puts mine to shame. Great Idea! Right now I’m using a small corkboard along the bottom of my dry-erase calendar. I switch out the artwork once they bring a new one home. But I’ve been thinking of doing the frame thing with the clothespins. My boys only go to Mommy-and-me once a week so we don’t have too much artwork so far, but I really love your idea for when they start to bring more home! i actually have the same ikea curtain hanger things for my kids art too! it looks no where near as organized as you, so it was good to see how someone else put it to use. time to re-organize mine!! @Cherie: The color of our granite counter tops is Giallo Ornamental – we love them! @Chris: So far I’m just storing Kate’s “keepers” in a tote, but I love Athena’s comment in this post about scanning them in and creating a digital art gallery! @Tristina: My friend Jill did that empty frames and clips idea, too – that’s such a cute idea! Thank you so much for all your great comments, everyone! It’s fun to hear other ideas and get your feedback! Where did you find your calendars ? Hi Nikki – they’re from Pottery Barn.